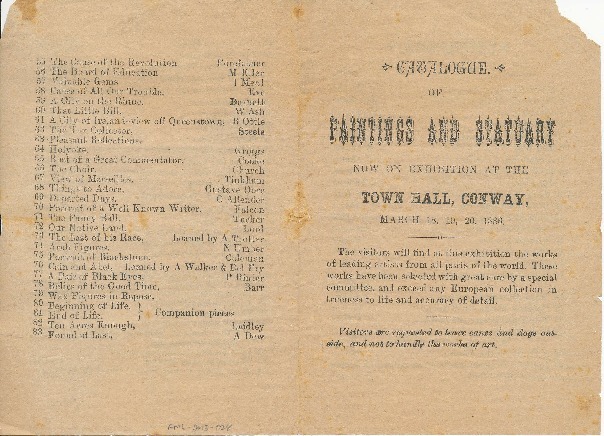 Printed 4-page catalog, 4 1/4" x 6 1/4", of "Paintings and Statuary Now on Exhibition at the Town Hall, Conway, March 18, 19, 20, 1886." Includes 83 "works of leading artists from all parts of the world." Corner torn; foxing and stains. Unknown, “ Catalogue of Paintings and Statuary for 1886 Exhibition,” Conway Historical Society, accessed April 21, 2019, http://conwaymasshistory.org/items/show/949.